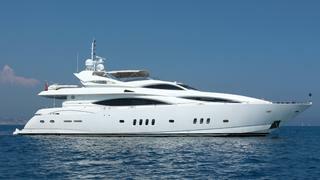 Tom Barnes at bluewater tells me there's been a €500,000 price cut on the 31m motor yacht Sea Raider IV. An example of the very successful Sunseeker 105 models from 2004, Sea Raider IV boasts luxurious accommodation for nine guests in a split level master suite, full beam VIP stateroom and two twin cabins, one with a Pullman berth. The yacht has had one owner from new and benefited from constant upgrades, including most recently the installation of Sidepower zero-speed fin stabilisers in November 2011. Twin 2000hp MTU engines power Sea Raider IV to 26 knots and, lying in Imperia, she’s now asking €2 million.